Since introducing Minerals by Annmarie Multi-Purpose Foundation, we've been overwhelmed by the positive responses. We're really happy that so many people are excited about taking another step towards a beauty routine that is free of toxic chemicals. After working for a long time on this makeup and then releasing it to all of you, we're wondering how you love using it and what your experience has been so far. We'd really like to know! 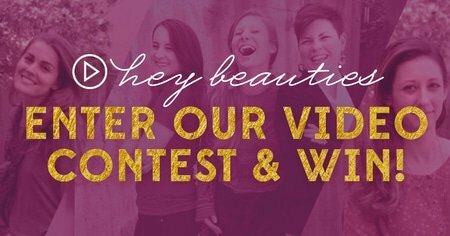 So if you’ve used Minerals by Annmarie Multi-Purpose Foundation, we invite you to share your story with us by entering our Minerals by Annmarie Mineral Multi-Purpose Foundation Video Contest! Enter and you could win a heaping dose of gratitude (aka prizes) from us! Haven't used it yet? Click here to get the full-sized, and click here to try some samples. Comment below with a link to the Youtube video you created. 10 Minerals by Annmarie Multi-Purpose Foundation sample kits to share with family and friends! 5 runners up will receive a free, full-sized bottle of Minerals by Annmarie Multi-Purpose Foundation, so you have lots of chances to win! Not sure if you received my link to the youtube video in the commenr above. It says that my comment is awaiting moderation…. This is my first ever video so you can see how nervous I was, but I love your new Minerals by Annmarie makeup so much that I just had to let you know – especially in comparison with another mineral foundation that I have used but not with as much success. Thank you for another great product! I love the quality and feel the Annmarie-team love every day! I’m in love! I’m smitten! I love your company and this product is pretty much my favorite thing in the world. Thank you for your creations Annmarie! I love your company so much I want to be a part of it! Lol my love for your line is that passionate, they’ve really brightened up my life. Thank you! Hi Leela, thank you for submitting your video. So glad to hear you’re loving the makeup! Just have to add that the more I use the natural minerals, the better I like it! Just love it for all Over my face and even to hide dark circles under my eyes and to give the eyelids a nice Neutral finish. A very nice way to create a flattering even toned canvas to lay your makeup over. Plus it lasts all day! Never have to touch it up. ❤️. Of course the fact that I am not putting harmful or controversial ingredients into and into my skin is a no brainer! I love your products! I also tend to be a very private person who doesn’t really post videos online! It made me sooo nervous that I went back and forth about even entering this contest. I hope that the fact that I even submitted one, shows how much I believe in your products! Hi there! Thanks for making a video, your skin looks lovely! I love all your products!! All my skin care is Annmarie Gianni and now, my make up is Annmarie Gianni. I am 44 years old, and people do not believe my age because my skin looks radiant and make me feel beautiful every day. I have a secret: When I apply my Annmarie products I always say positive affirmations, and I am grateful that these wonderful products are available, they are a gift from nature. Keep doing this excellent work Annmarie, I know you work together with your husband and your exceptional team to keep a high quality on your products. I love the healthy products by Annmarie. The new make up is just what I have been waiting for. Love it! I tried to send my YouTube video earlier, but I think I sent it to Customer Service by mistake. Hopefully, this will work. I don’t usually make videos to review products but I couldn’t resist this opportunity to tell you how much I really like new product! I just adore Minerals by Annmarie! I am the kind of person that reads every single ingredient in the products that I use and it takes me a very long time to do, as I research each one. Quite often I’ll find a product that I think could be good to use but when I get to the 10th ingredient I am extremely disappointed because it’s something that is listed as a carcinogenic or possibly unsafe ingredient and therefore I don’t want to use that on my face or body. Thank you so much! Your “good for your skin products” help a lot, and give Peace of Mind as well. No more worries about what I’m putting onto my skin. Unfortunately, I don’t have a way to record my now daily ritual, but would love to share my journey with you. I love all of my Annmarie Skin Care products and will continue to recommend this clean product to others. Thanks again for caring enough to create such quality products. I’m addicted! Being my first ever attempt at doing a video, I do hope this turned out okay. So nervous, but decided to do it regardless of the fears! Nice Shawna! I love your video and the foundation looks awesome! Love it!! Thank you for your submission and your kind words. The camera loves you. 🙂 Glad you’re loving the makeup!! I don’t have any way to make a video either but I did want to tell you how much I love the new mineral foundation. Because I wasn’t sure which color to purchase, I did get the samples. I’m glad I did because I would have chosen a shade that would have been too light for me! I’m still finding the perfect ratio of oil and the powdered foundation. I am delighted to discover that this foundation goes on smoothly and covers my face perfectly. It stays on all day and doesn’t rub off. So much better than any other foundation I’ve ever used! I am SOOOO happy with it. When I saw the price, I was a little concerned but after using the samples, I know this foundation will last a long time and is well worth the cost. Plus knowing I am putting something good on my face makes me feel happy and healthy! Thank you! Thank you! Thank you! I love the new natural foundation…:-) it looks natural and my skin doesn’t look cakey! Thank you for making this make up! I love love your new makeup! I hate wearing makeup. It is always feels like I have muck on my skin, heavy and weighty. I have longed for something light and something to make my skin shine and glow. Your makeup is simply amazing! I love it. It does not dry out my skin, it is light and I look amazing. I love that is works with oil but does make your skin oily. I love that you can make your own color! I love that you can put it on light or heavy! You guys have done it!!! I am so very thankful for this makeup!!! I have been using the mineral foundation samples and just love it! I dont have a way to make a video so Im just telling my story here. The first time I used it, it was a bit itchy and stung but it faded away and gave me flawless, beautiful coverage. Covered the redness and havent had the itch or sting since. Yay! It’s nice to have toxic free makeup that I know is good for my skin! Im excited that this has become available for us who are conscious of what we put on and in our bodies. This has been the best I have tried yet! Thank you for your beautiful products!